Sunday: Colleen and I took the Core Power 1.5- Intro to Heated Yoga class. It. Was. Hard! I was so sweaty and kept slipping on my mat. Note to self: buy a fancy towel that everyone has. We also did a couple of inversions. And by "we", I mean everyone else in the class. I only attempted to lift one foot off the ground in Crow. And then there was the supported headstand. Um, yeah, probably not. For real, they are doing this in an intro class! I'm beginning to doubt my ability to ever move beyond this level. Monday: I literally cannot lift my arms without pain and the thought of Chaturanga makes me want to cry. No yoga today. 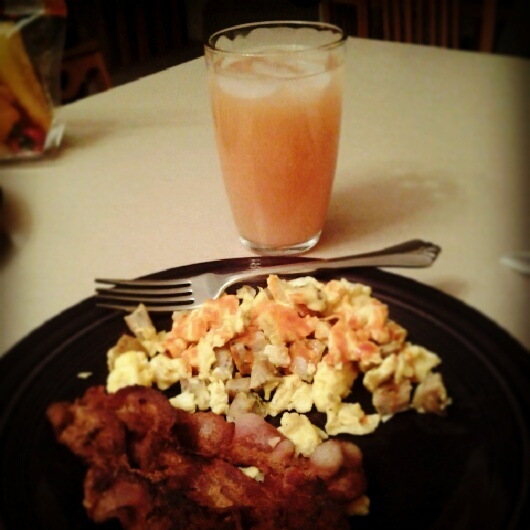 Instead, breakfast for dinner and Bachelor watching. Today: I regressed back to a C1 class after work today. I borrowed one of John's fancy towel things but failed to realize until we started class in Child's Pose that it was stinky dirty. Like hockey locker room stinky. Suffice it to say, the next 60 minutes were not relaxing. Also, I'm still too sore to high-to-low plank it. So after four days and three classes, my biggest takeaway is this: Yoga is like lifting weights with the added benefit of not having to see a bunch of hairless overly-tan dudes with their shirts cut down the sides strutting around the gym. In other words, this is something I could see myself really getting into. But why does it have to be so dang expensive?! Right! I told someone the other day that I do yoga partly to make myself strength-train and they were like "??" It makes a huge difference for me. Also, a towel is totally mandatory for me...although I've definitely had the "this one could have used a trip through the washer" cringe moment.